This how to article is written by Jeff McEachran, the national brand manager at Gyeon USA and owner of Detail Force and Denver Auto Shield in Denver Colorado. It is a finishing polish. It has a long working time and a little bit goes a long way. It is very easy to wipe off. It’s the WHY that matters most right. Honestly, it took me quite a while to wrap my head around where I would use this type of product and why. But now that I’ve played with it for 6 months I enjoy it and reach for it often. The products main design function is to aid in finishing down very soft and finicky paints and prep them for coating. It allows you to touch the paints surface one less time, because if you wait at least 24 hours between Primer and your coating application, you can skip the Prep wipe stage. 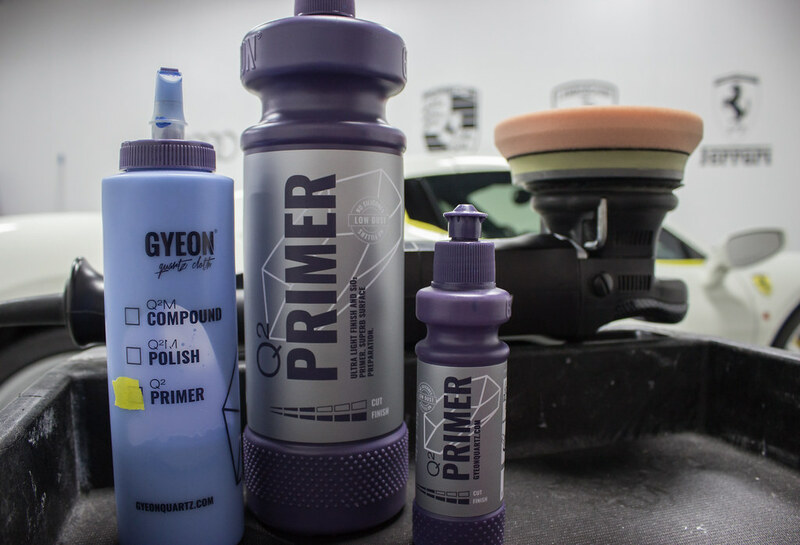 Primer is water based, so all of the lubricants in the product that aid in polishing will evaporate out fully in 24 hours, leaving you a dry base layer of SiO2 on which you can install your coating. If you have to coat under 24 hours from the time you complete Primer, then prep is still required. The base layer of SiO2 will also increase the durability of the coating applied over it. More often than not I do not have a 24 hour window between Primer and coating so I still conduct the prep wipe procedure. You want to wait at least 15 mins from the completion of Primer before Prep to allow the base layer of SiO2 to dry enough to not be affected by Prep. Q2 Primer, and the few other products on the market like it, tend to be driven towards the professional detailer installing long term warranted coatings. This is not the only place for Primer. 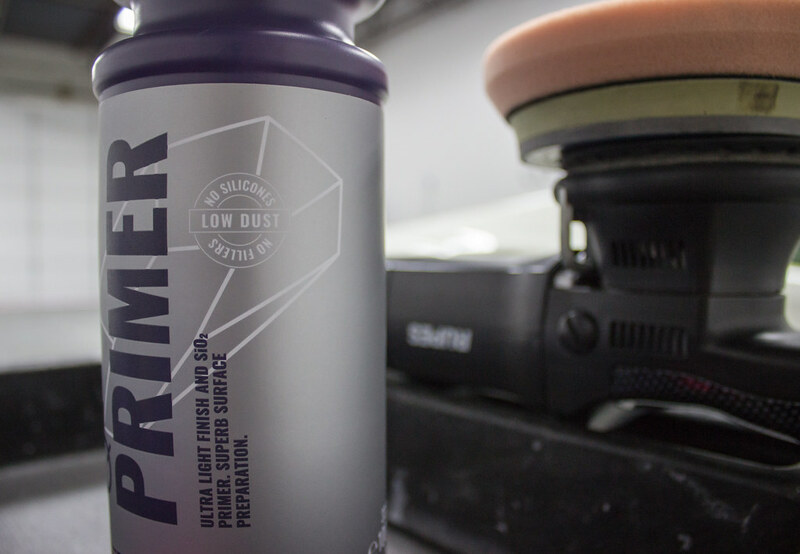 Primer works fantastically as a base layer under a traditional wax or sealant. It is also great for a light polishing service that you may want to top with Q2 Cure or Q2 CanCoat. We use Primer on new vehicles that are in great shape, where we want to do a light polish to bring up the gloss, and then coat. We use it as our finishing polish before coating on deeper paint correction projects. We use it for light details for a quick polish and then a Cure wipe down or a sealant application. Primer has surprised me on certain paints. The Rupes Duetto, Orange Griots Medium Pad, and Primer crushes through black Toyota paint and other soft paints with a superb finish. The only time we don’t use it is when we need more defect removal out of a single stage polish and we go for something else. 1. 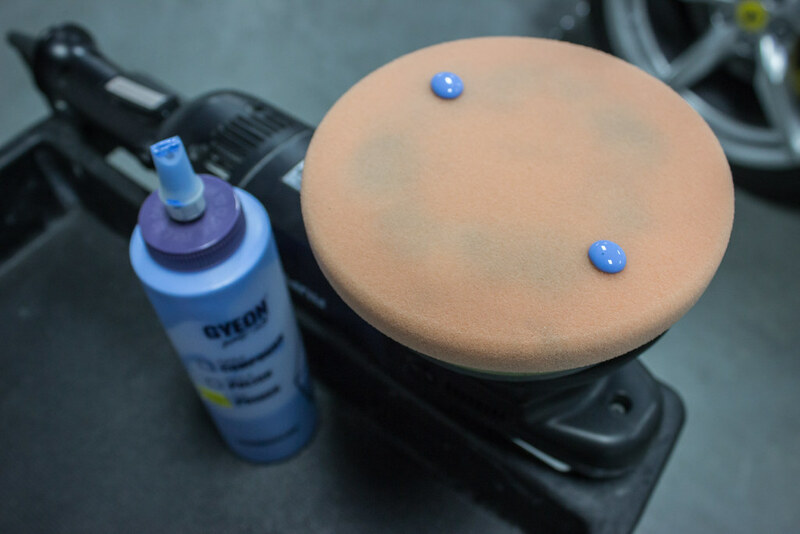 Apply 2 dots of Q2 Primer to your polishing pad. 2. Spread Primer over the area to be worked on low speed. Once spread, I like to work Primer on speed 4 on the Rupes machines with a variety of foam pads depending on the paint and where we are in the process. Primer has a long working time and will not dust. Work Primer until it is almost completely broken down and not visible on the paint. 3. Remove the remaining residue with a plush microfiber cloth and move on to the next section. Remember, if you are waiting at least 24 hours between Primer and installing your coating you can skip the Prep wipe down stage. If you are coating under 24 hours from your Primer then you should still perform a prep wipe. You can install any coating over Primer. You can install wax and sealants over Primer. Find where it fits your detailing procedures best! Cuántos meses dura su protección por si solo? Y cubierto con Q2 Cure cada 8 semanas? Basically same product than carpro Essence? No sir. Q2 Primer does not contain any fillers. Could I use this as a light polish on a clear bra? Hi Glenn. Personally I have never done so. I cannot foresee any major issue. I would perform a test spot to make sure you are happy with the result. Anyone else thinking of something I am not? Great write up Jeff. I used this recently on a personal vehicle and let it sit overnight (roughly 24 hours) prior to applying can coat. The results were great. I am looking forward to testing out this combo long term. Awesome!! Thank you for the feedback. Thanks for the info; have been having an occasionally irritating time lately with Prep wipedowns marring on soft black paint prior to coating. Ordered up some of this magic from DI yesterday (of course, a few hours later they drop 15% off…eh, no big deal), will give it a shot soon. Curious if you ‘dust’ the car off after 24hrs cure prior to coating? 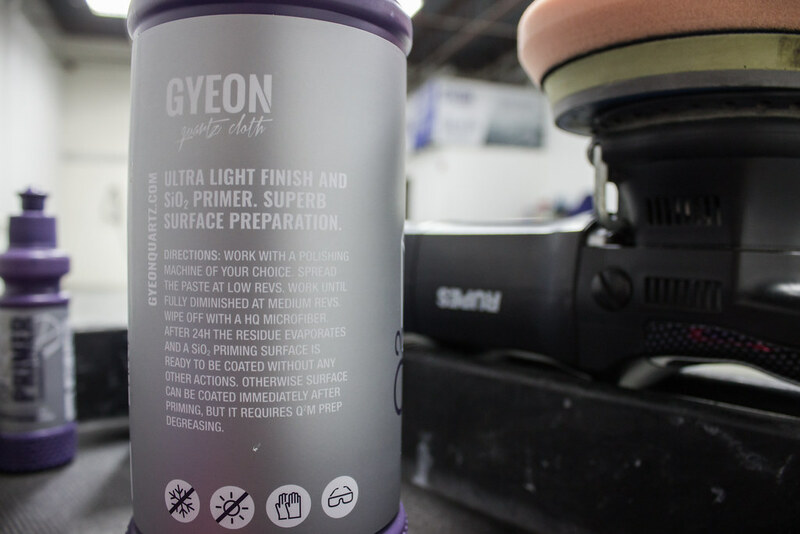 Gyeon SoftWipe might be a good choice for that task? Or low nap BaldWIpe? This is exactly what Primer was designed for. To be able to touch finicky paint one less time. I do perform a “dust drag” with a SoftWipe right before coating. Let us know how it goes! Hi. Can the primer be used as the final step without applying coating afterwards? Anyone tried that? Why are some of the caps of Gyeon bottles of product so damn difficult to remove??? I’ve paid/received a number of them; I haven’t any kids & I want it open on the first or second try, particularly for that $$$-they make it hard!!! Finally gave the Primer a run, used it prior to Gyeon One application. It’s quite the treat to use, very small amount needed. Was a new vehicle, only 750 or so miles no after chemical/physical decon (and Silver paint) this was enough to get the job done. Left a very, very nice finish…looked freshly coated after done. Let sit 24hr and then dropped the One on it. Used Flex 3401 w/ LC Force Hybrid Black Finishing pad; came out great. Will try to use again when doing Gyeon Coatings as it’s just such a nice product.Easy wipe off as well. New car – soft paint – use with Lake county white pad or black finishing pad for better results?